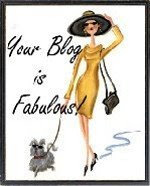 There are rules associated with this blog award: Name 5 other fabulous blogs and share 5 things that you find fabulous. So, first up, 5 Fabulous Blogs. Hoyden About Town – Down to earth Down Under feminism from Tigtog and Lauredhel, and a fabulous commenting community. In a Strange Land – Deborah is a Kiwi transplanted to South Australia blogging about feminism, parenting and politics. Sophie in the Moonlight – Heart wrenching, courageous and full of hope, Sophie shares her experiences of being bipolar. A Room of Mama’s Own – MPJ’s writing is full of her fierce love for her family as she blogs about autism, addiction and self-discovery. Grab Your Fork – Whenever I read one of Helen’s delectable posts I end up ravenous, quite apart form anything else there’s all these gorgeous photos of food. And now, 5 things I find fabulous. Misty mornings, or any time of the day really. Especially when camping. When we went to Beorg-wic back in October there was one afternoon when the clouds rolled down into the valley, settled over the campsite and turned the whole forest into a magical misty realm. Hot chocolate milk with butterscotch schnapps. Ocean waves breaking against the rocks. I could spend ages just sitting and looking down from the cliff tops on North Head. Stanton and Killeen Grand Muscat. OMG so good. The first time Adam and I tried this, a few years ago, we’d just bought a mixed case of their wines at the cellar door and were offered a free tasting (usually you’d pay to taste this one). We looked at the price and regretfully chose to be sensible, leaving without buying a bottle. Half an hour later we were driving along the Hume Highway still savouring the aftertaste and saying to each other “we SO should have bought some!” So I got him a bottle for Christmas a few weeks later. It just goes to show how much your kids love you. I remember my mum’s heart breaking when my Bir brother at 8 asked if he could kiss his mum goodbye at home. Not everyone can be as strong as us though Mim. I didn’t notice that because I logged into my LibGuide first. I therefore commented as emma the librarian not yodaobi. I’m glad to know your eleven year old son still hugs you! Jack is still VERY cuddly. I hope he stays that way. Aaww, thanks, Mim. I will officially accept your award on Saturday. It’s going to take me that long to narrow down the five bloggers to whom I pay it forward. But, being called fabulous makes it all worth it. Muah, Mim! Thanks so much! I’m going to try to do this one today.